One way to retain employees in a company is to offer rewards and benefits during their employment. The most common is through periodic awarding programs which allows employees to know that their works and perseverance have been acknowledged, as well as valued by the company. This program can be conducted with ease by using employee of the month nomination forms. 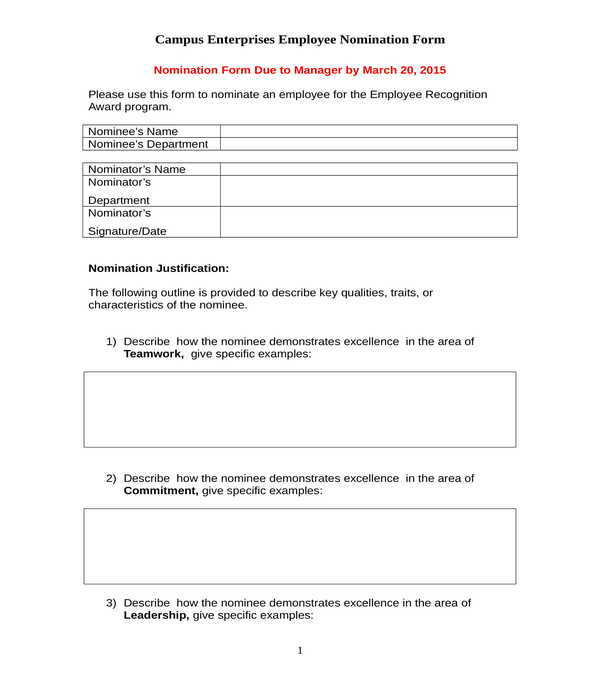 What Is an Employee of the Month Nomination Form? 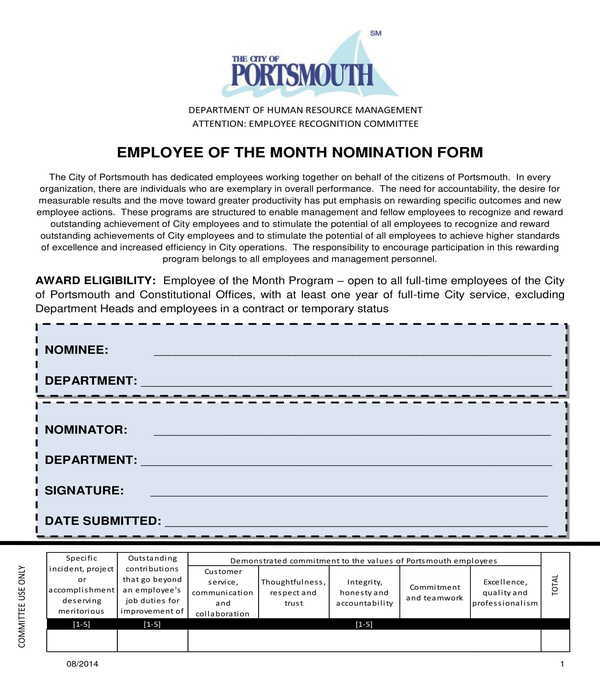 An employee of the month nomination form is a type of HR form which is used by managers, employees, and any member of a company to name nominees of the monthly employee award. The form will allow the selection committee to identify who among the nominees have shown impressive productivity, abilities, and skills within a specified month or during the thirty-day period. What’s in an Employee of the Month Nomination Form? The nominee’s or the employee’s data: This is where the general information of the nominated employee will be stated such as his name, his job position, and the department that he belongs in. 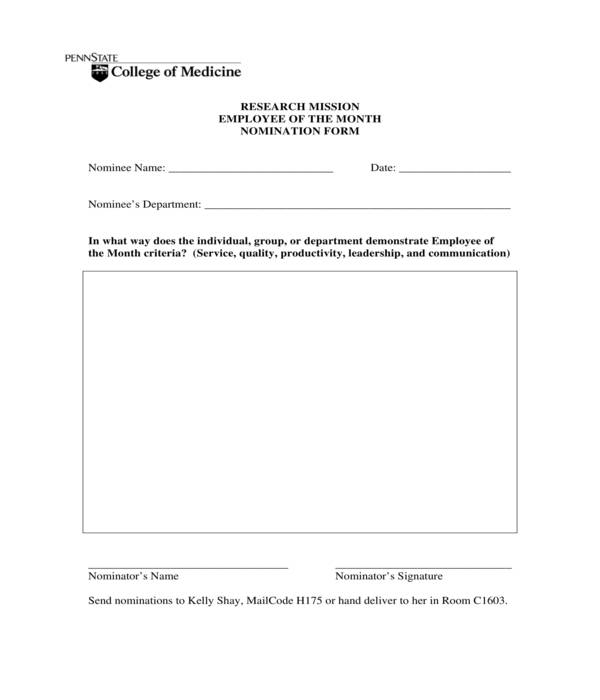 The nominator’s information: The nominator is the person who is nominating the employee to be a recipient of the award. In this portion of the form, the nominator’s name, position, department, and connection to the employee will need to be disclosed. Additionally, the date when the nominator filled out the nomination form will also have to be included in the form. The justification or reasons of the nominating party: In order to prove that an employee is indeed eligible to be nominated or be considered for the employee of the month award, the nominator should enlist and justify his decision. The justification includes the description of the nominator towards the employee’s strengths, commitment, leadership skills, and outstanding accomplishments. On the other hand, companies also incorporate rating scales in the nomination form to allow nominators to easily plotting their scores along with their explanations as to why the employee deserves to be nominated. The approval section: This section is not to be completed or be answered by the nominator since it is only to be filled out by the supervisor or the head of the selection committee. This is where the choice of the selection committee will be documented of whether the nominee is considered as one of the top awardees or the employee of the month of the company. 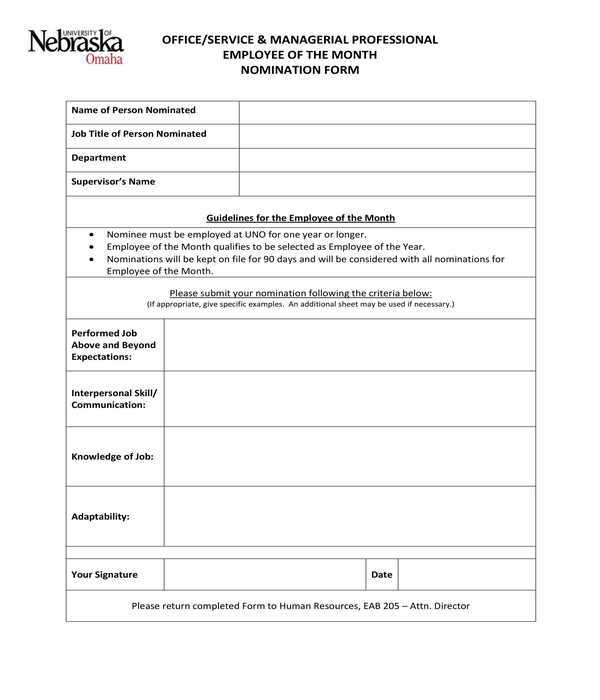 Automated Employee of the Month Nomination Form – With this form variety, a nominator can easily fill and print out the form as soon as he completes the necessary entry fields. Three sections comprise the automated employee of the month nomination form. In the first section, the nominator will be required to state the name and identification number of the employee nominated for the award along with the basic information of the nominator himself, and the approval of the department’s director. The second section of the form is allotted for the award criteria. 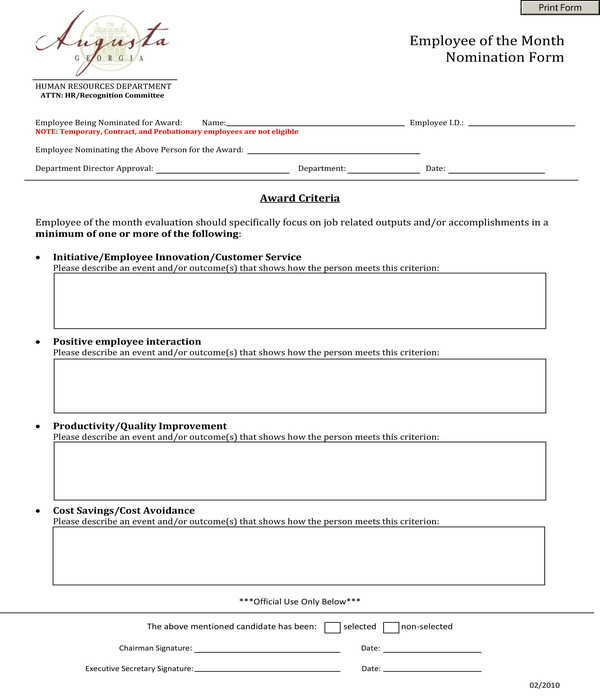 This is where the nominator can state his evaluation and assessment to the employee that he is nominating such as the employee’s initiative, interaction, productivity, and cost avoidance techniques. Furthermore, the last section of the form is not to be filled out by the nominator, rather by the authorized personnel or HR representative of the company who will compile the completed nomination forms. The decision of whether or not the nominee had been selected and the signatures of the company’s chairman and secretary will be the contents of the last section. 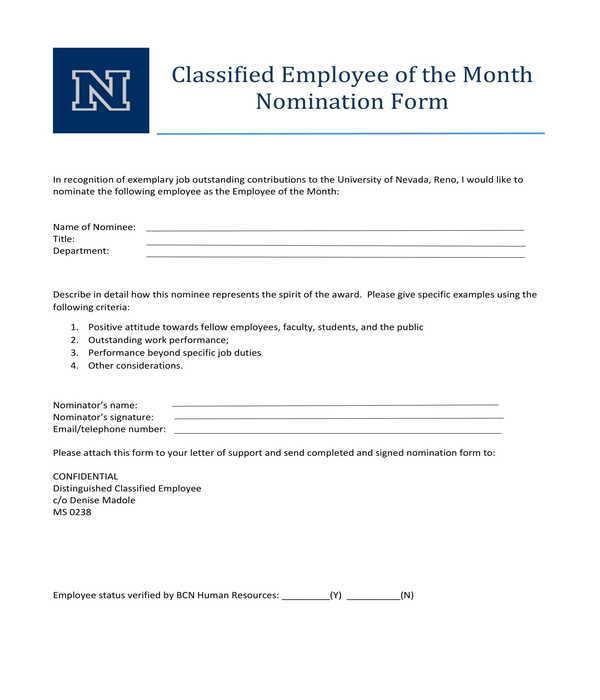 Classified Employee of the Month Nomination Form – Compared to regular employees, classified employees are hired periodically and are often paid on an hourly rate. Examples of classified employees are clerical staff members and construction workers. 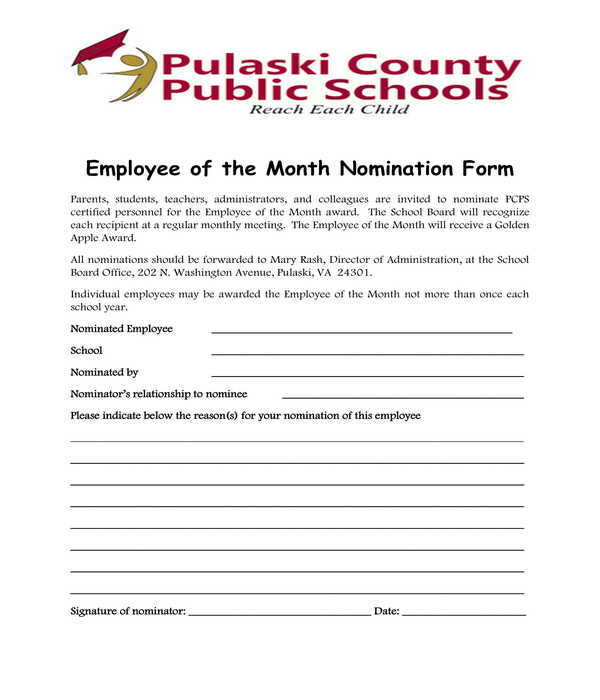 To nominate an exemplary classified employee, a classified employee of the month nomination form must be filled out by the nominating party. This form will document the name and the job title of the nominated employee as well as the nominator’s basic data and reasons for his nomination. In addition, the contact information of the nominator will also need to be included in the form to allow the company in reaching out to the nominator for clarifications and questions regarding his choice of nominee. 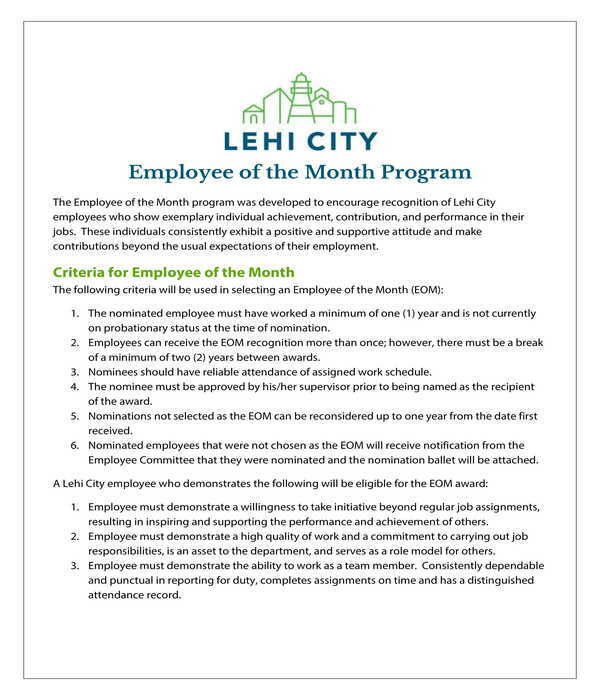 Employee of the Month Program and Nomination Form – Not only the details of the nominee and the nominator will be stated in this form variety but also the details of the awarding program and criteria to be considered for the winning nominee. The form also specifies the process of the awarding program starting from the posting of the nomination forms up to the selection procedure. 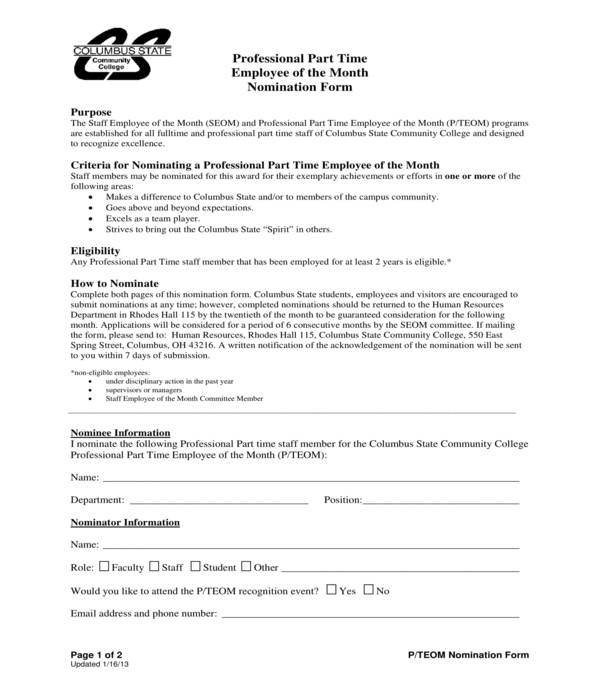 Professional Part-Time Employee of the Month Nomination Form – Although part-time employees only spend smaller hours compared to full-time employees, their services and expertise should still be awarded. For this, a professional part-time employee of the month nomination form should be used by the company. In this form, the purpose of the program, the criteria for the nominees, the eligibility rules, and a guide on how to nominate an employee will be stated. Additionally, the form will also collect the information of both the nominee and the nominator along with the detailed description of the nominator to prove his nominee’s suitability for the award. 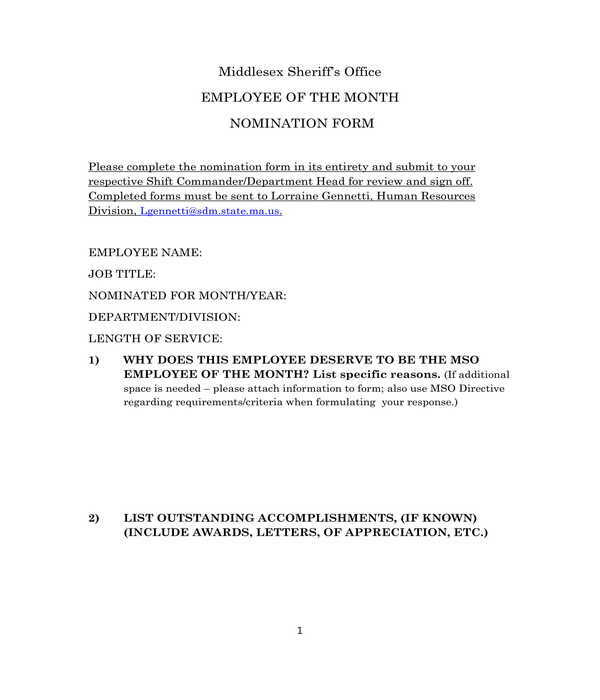 Why Are Employee of the Month Nomination Forms Important? 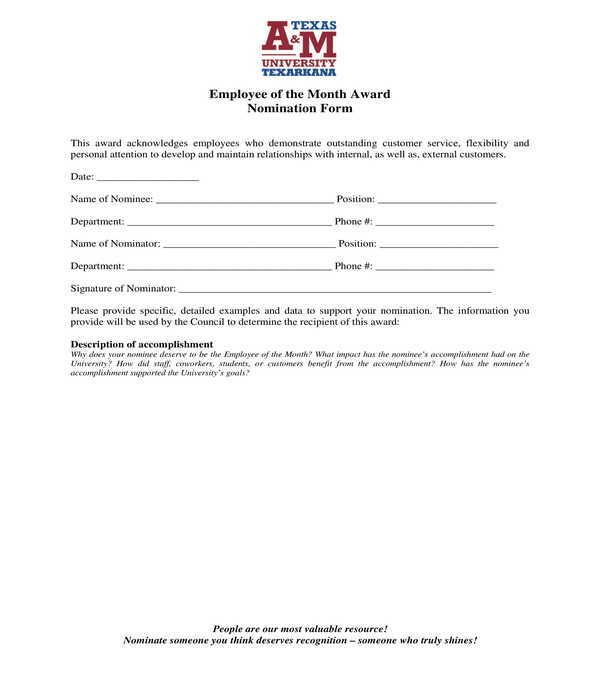 Employee of the month nomination forms are important because these documents serve as a tool for gathering data, information, as well as surveying who is the preferred choice of the members of a company. With the form, it will be easier for the selection committee to compare and finalize who will be awarded as the company’s employee of the month. Furthermore, the form will also promote communication between the company management and the employees if the forms are to be distributed and are offered to every employee of every job type and title.